Losing weight takes dedication and commitment; there is no overnight way to achieve weight loss. If you want to lose fat, you must reduce your calorie intake and move your body more. You body needs to burn more calories than it takes in. Weight-loss supplements such as protein shakes can aid in muscle recovery, but drinking protein shakes alone will not help you to burn fat. You must exercise and totally modify your diet to see a change in your body. Including exercise into your weight loss regimen is vital if you want to burn fat efficiently. Cardiovascular exercise will help burn fat and keep the heart healthy. Include 30 to 40 minutes of any form of cardiovascular exercise three to four times a week. For example, consider cycling, jogging, dancing and power walking. Any exercise that increases your heart rate is a cardiovascular exercise. Your body burns the calories you have consumed and uses the excess fat as energy. The food you eat can affect the speed at which you lose weight. If you drink protein shakes and exercise without modifying your diet, your weight-loss progress will be much slower. Therefore, examine the food you consume to see where you can change your diet. For example, if you have a sweet tooth, instead of eating candy, add plenty of fresh fruit to your diet. Strawberries, grapes and oranges are all good examples of fruit you should include. Add nuts, raisins and dried cranberries to replace the sweets you would ordinarily consume. Add plenty of fiber to your diet by replacing white rice and pasta with brown rice and whole-wheat pasta. Instead of white bread, eat whole-grain bread, which is lower in calories and higher in fiber. Fiber will keep you feeling full and aids digestion, which prevents bloating and reduces your appetite for unhealthy snacks. When trying to lose weight, it is important to include some form of protein in your diet. Protein helps your muscles to recover after exercise. 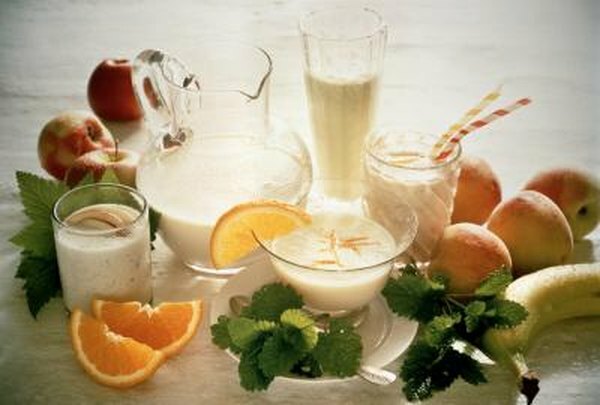 Protein shakes are excellent sources of protein, especially if you go for high-quality whey protein. Whey protein contains the highest dose of amino acids compared to other types of protein shakes such as hemp protein and soy protein. To get the most out of any protein shake, you need to drink at least 20 grams of protein daily. If you want to burn fat and lose weight, include plenty of water in your diet before, during and after working out. Do not just focus on drinking protein shakes and forget about drinking water, which plays an important role in weight loss. It increases the metabolism and flushes toxins from the body. All of your vital organs need water to function efficiently. While protein shakes aid in muscle recovery, they also contain many calories, especially if you drink more than the recommended amount. One large protein shake made with skim milk has just over 250 calories. Over time, these calories add up. Therefore, stick to 20 to 25 grams of protein, exercise three to four times per week, and eat a healthy diet to burn fat and lose weight.